Leader Danielle Smith is among a group of at least six Wildrose MLAs planning to cross to Alberta’s governing Progressive Conservative party, CBC News has learned. Leader Danielle Smith is among several Wildrose MLAs planning to cross to Alberta’s governing Progressive Conservative party, CBC News has learned. CBC News was told by two party sources earlier Tuesday that Pat Stier (Livingstone-MacLeod) was among the group crossing. However, Stier posted a statement late Tuesday evening on his website saying that he is staying with the Wildrose. "When a time for change becomes necessary for elected officials, in my opinion they should then follow a procedure that includes their electorate in the new process, prior to making such a change," he said. "Unfortunately, the procedure that has been pursued by some of my Wildrose Caucus members would appear not to have provided the electorate such an opportunity, therefore I cannot support it." 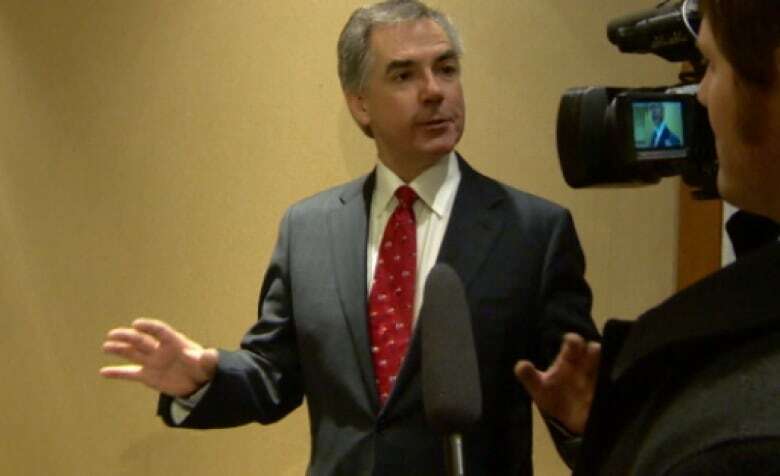 Alberta Premier Jim Prentice was asked about the potential floor crossings as he was leaving a breakfast event in Edmonton on Tuesday. "These matters are dealt with at our caucus and certainly we'll deal with it tomorrow," he said. (CBC )Currently, the PCs have 63 seats, the Liberals hold five, the NDP have four. There is one independent MLA. The PC caucus is meeting on Wednesday. Earlier in the day, Prentice refused to answer questions about any potential floor crossings.